Photographer cleverly edits himself into childhood images to hang out with his younger self | Do You Know? A Montreal student has taken his passion for photography to the next level by re-inventing his childhood photos with editing himself into his childhood photographs, to create wild time-defying images that have even his close family members doing double takes. 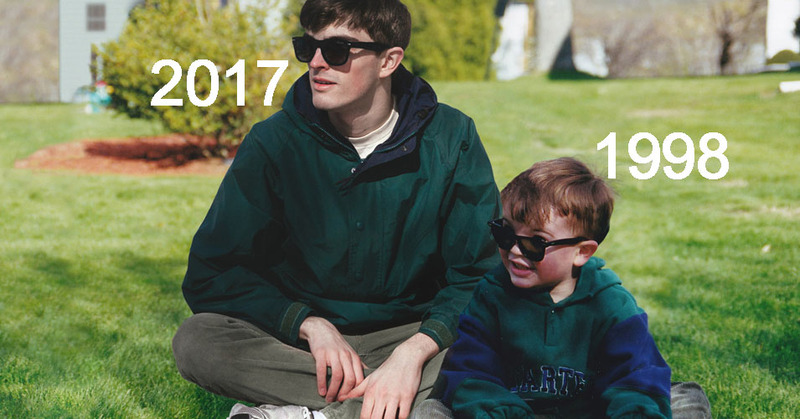 Conor Nickerson, a photo editor at the McGill Daily, took to social media to share his throwback collection of 11 images in which he has Photoshopped himself to be side by side with his younger self, ,making it look like the two are the best of buds. His collection spans his brightest moments from 1997 to 2005 that displays the two jamming out in a music garage, posing in tuxes, apple picking in an orchard, and blowing out their own birthday candles. But editing himself into throwback photos isn't the only magic Conor can conjure. The young artist is a fan of experimenting with his editing skills and recently launched another photo series where he restores color to vintage black and white photographs. He took to Facebook to share two images of his grandfather in uniform serving in Seoul during the Korean War in 1952, one as the faded and colorless original and the second a restored full color image that looks like it could be taken today. The series joins his evident photography passion for nostalgic art.